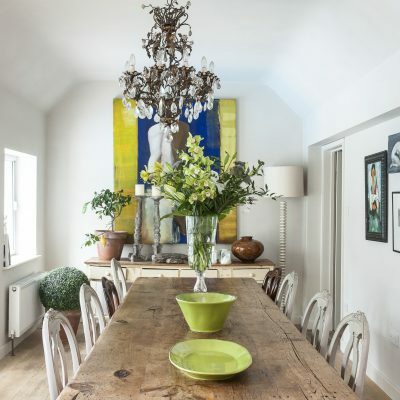 Few homes demonstrate this better than Home Farm, a Grade-II listed farmhouse and outbuildings tucked into a valley on the North Downs near Charing. Once part of a large country estate, the farmhouse was last lived in by a tenant farmer and his family – though it’s easy to imagine the generations who would have lived here over the years, since the 16th century. As with many houses in the area, the older part of the house dates from the 16th and 17th centuries, while a Georgian facade was added later. 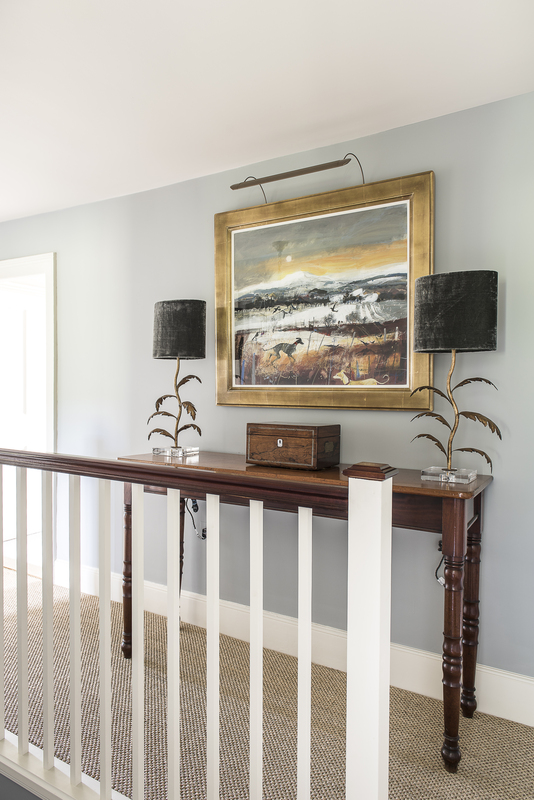 Fortunately for Home Farm, its current residents were adamant that they wanted to maintain a farmhouse feel and employ the best craftsmen and designers to help them do this. The couple, who had already worked with Cox Restorations and Evernden Interiors on a nearby property, were keen to employ both companies again. The results speak for themselves. 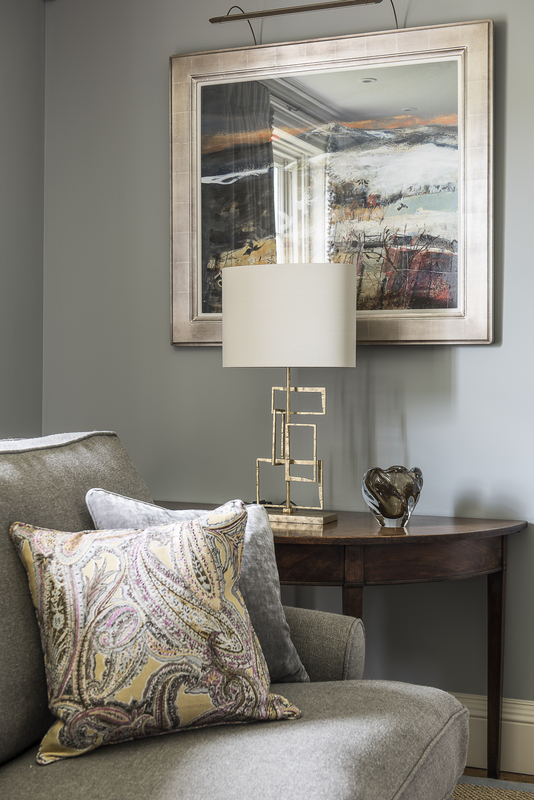 “I remember coming to the house when our clients had just bought it,” says Belinda Benton from Evernden Interiors. “I thought it would be lovely to walk in the front door and be able to look straight through the house.” So a wall that had previously butted into the hallway, creating a dog-leg, was subsequently repositioned. 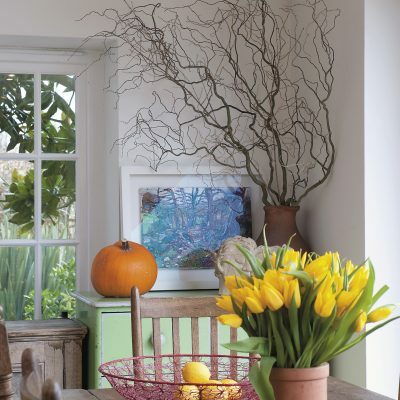 This instantly opened up the hallway and created a tantalizing view through the house and into open countryside. 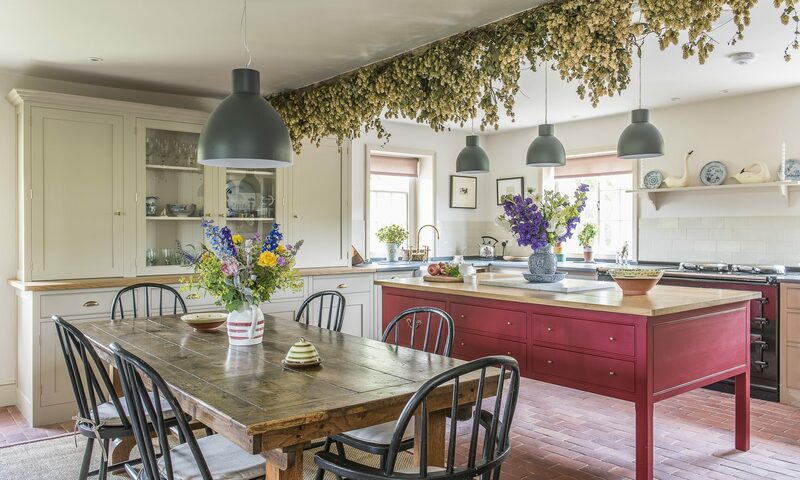 As with any decent farmhouse, the kitchen is at the heart of the building, and reached via the widened hallway. 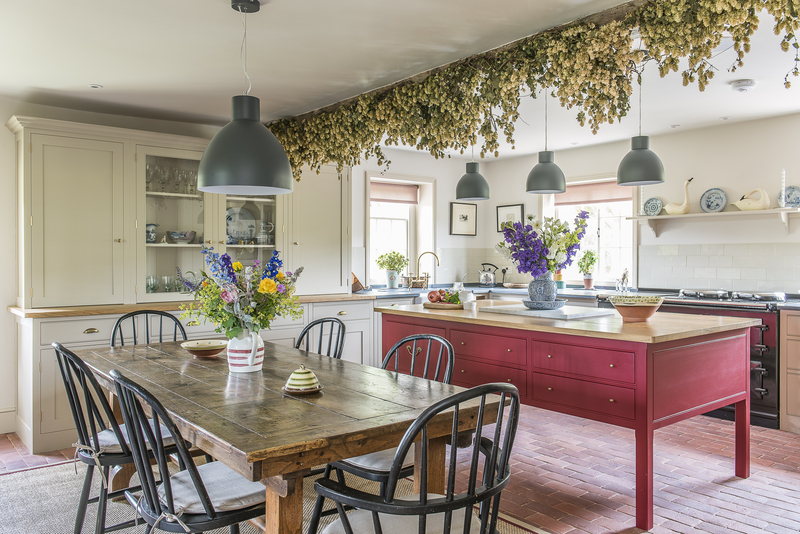 A stunning Plain English kitchen, including a fully wired-in central island, looks perfectly at home alongside an antique refectory table… though one can’t help notice the absence of mud and mess. 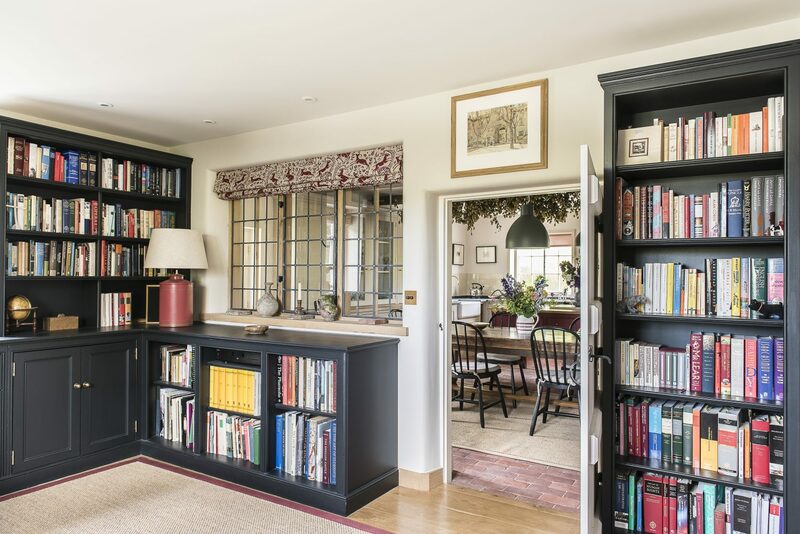 “Our client was very clear that she wanted us to bear in mind that this was always a farmhouse and not to veer too far from that, and to keep a relaxed feel,” says Belinda. The clever trick is that the kitchen feels as if it’s developed organically, over the years, when in fact it’s completely new. Quirky Elizabeth Blackadder prints dot the walls, while contemporary pendant lamps are a break from the traditional. The bookshelves have been painted in a very dark blue/almost black. 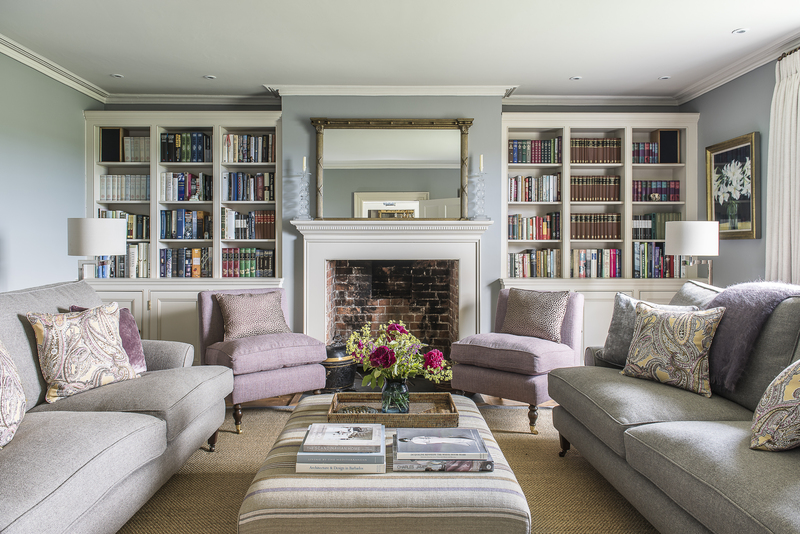 “We took the plunge and painted the shelves in this very dark palette. It’s fab, exactly the effect we wanted,” says Belinda. An oak-framed, leaded window – in what was once an exterior wall – allows light to flood in through the study and into the kitchen. “Cox’s took out the leaded window, restored it and put it back, replicating the style on either side, and framing it with oak,” says Belinda. 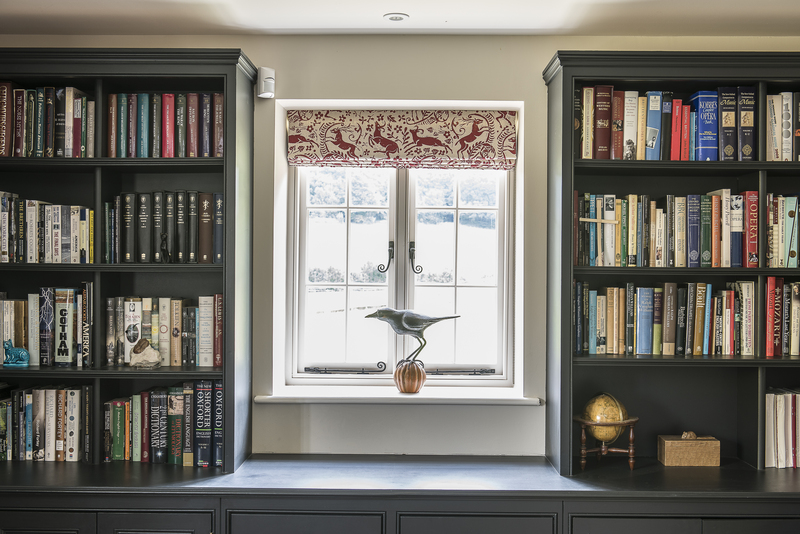 The oak shelf under the leaded window holds a collection of medieval artifacts while the blind overhead, featuring block-printed stags, has a medieval look. 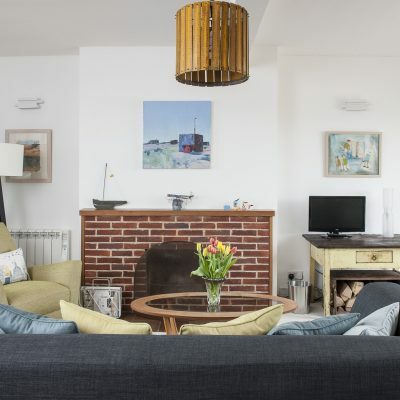 “Our client spotted that fabric which, given her husband’s love of the medieval period and the colour red, was spot on.” The fabric is a design by Lindsay Alker, who is based in Hastings. A staircase leads up to the ‘gentleman’s suite’ of dressing room and bedroom. Our tour continues into the next room – now the snug and formerly the kitchen. “You could say that it lacked inspiration…” says Belinda. 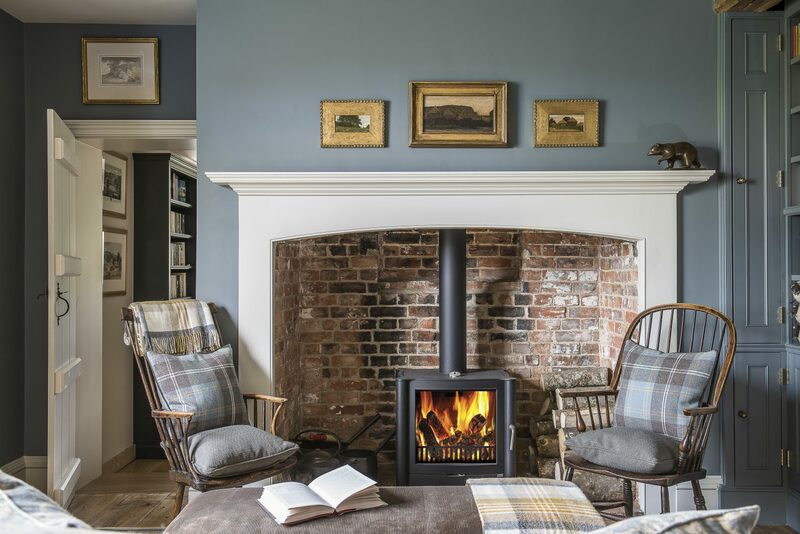 “There was an old Aga, a cork floor, a central heating boiler behind a false wall and formica everywhere.” Much to everyone’s delight, the false wall not only hid the boiler but also a wonderful old brick fireplace. 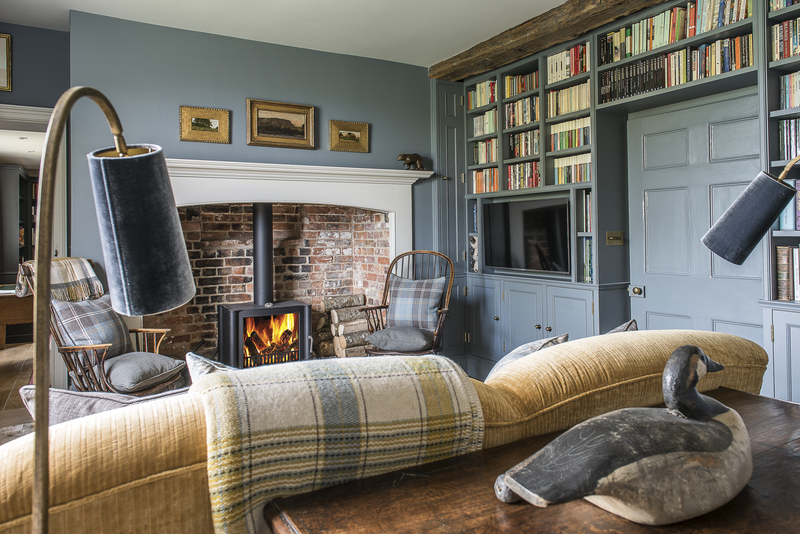 Now the owners’ favourite room, it is painted in a moody French blue by Paint and Paper Library, with the wonderful name ‘Btwn Dog & Wolf’. 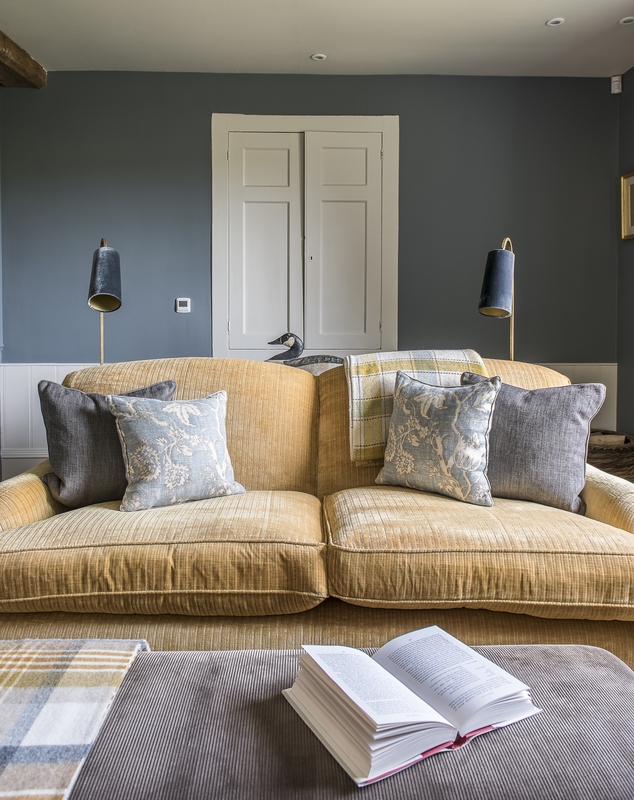 The sofa and footstool were made bespoke, while the antique farmhouse furniture came from the owners’ previous home. 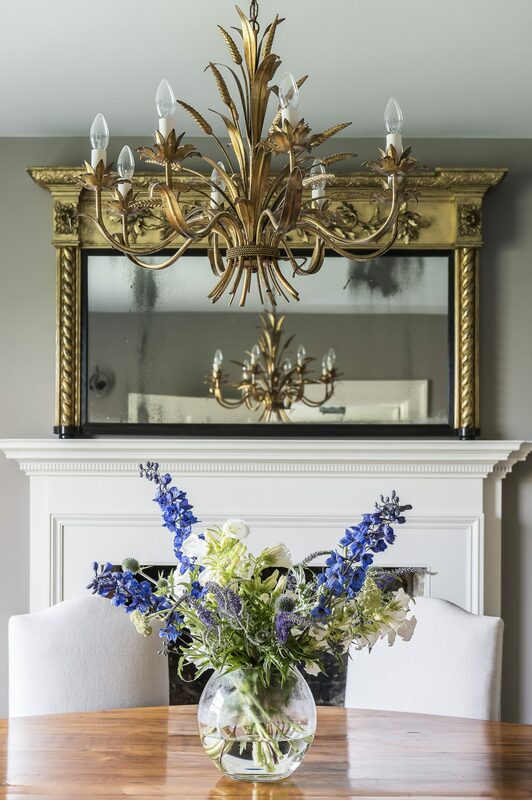 Gilt-framed Victorian paintings hang over the fireplace while a cluster of smaller paintings decorate a corner. 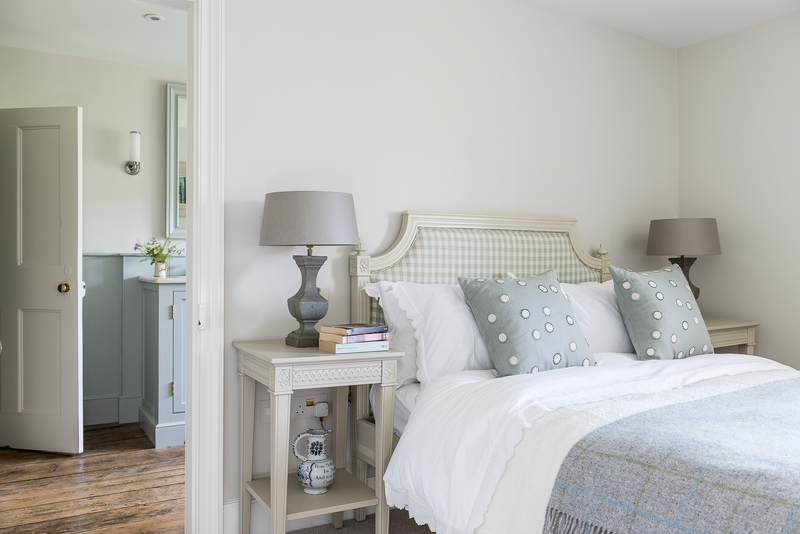 The overall effect is calm, cosy and uncluttered. As we go back out into the hallway and towards the Georgian front of the house, the rooms immediately take on a more classic feel, both in dimensions and decor. To the right as you come in the front door is the drawing room and to the left is the dining room. 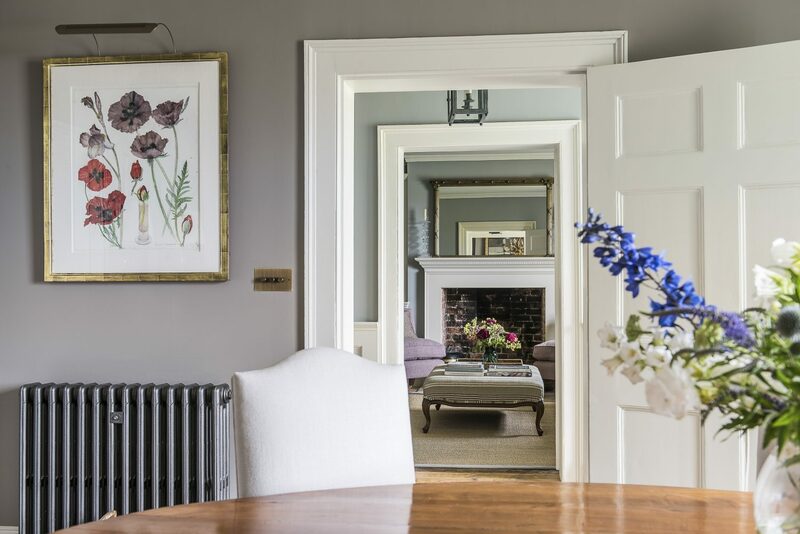 Across the hallway, the dining room is a ‘work in progress’ though key features are already there including a vast sash window, open fireplace and high ceilings. 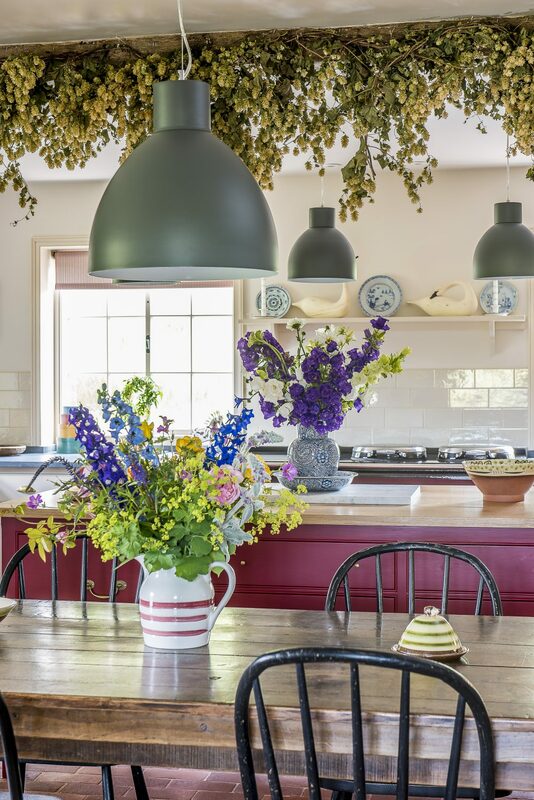 “The wheatsheaf chandelier is from Phoenix Antiques, and seemed rather appropriate given the farmhouse setting,” says Belinda. A glance out of the window reveals a stunning thatched barn, bought as a frame and reconstructed by Cox Restoration. Beyond that is a tithe barn, roofed in Kent pegs, and home to the owners’ three horses. 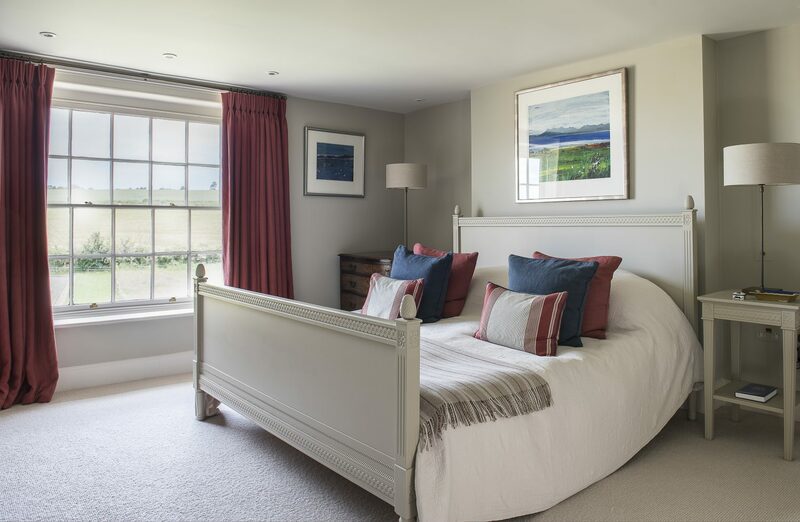 The views from every room are unspoilt; lawns, horse paddocks and the farmyard. Upstairs, the views are even better. As with the downstairs, it’s easy to see where the old finishes and the new begins – if Georgian constitutes ‘new’. The upstairs has been divided into ‘his and hers’ suites as well as a guest suite and another study. All lead off a wide, central landing. A huge sash window overlooks a sand school and the valley beyond. According to the architect who worked on plans for the house, sash windows such as these, which are five-panes wide, are extremely rare. Despite being in the old part of the house, the room is lovely and light. 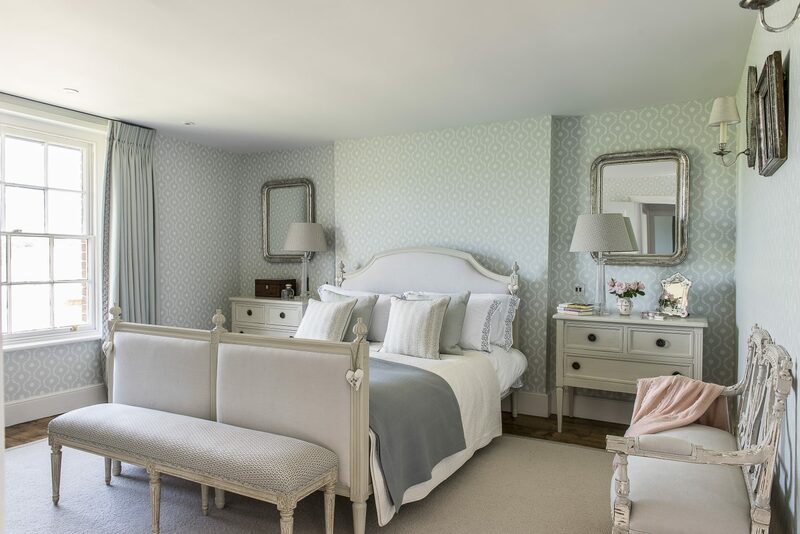 “The wallpaper is by Cole & Son, the curtains are lined with fabric by Veere Grenney and the trim is by Samuel & Son,” says Belinda. 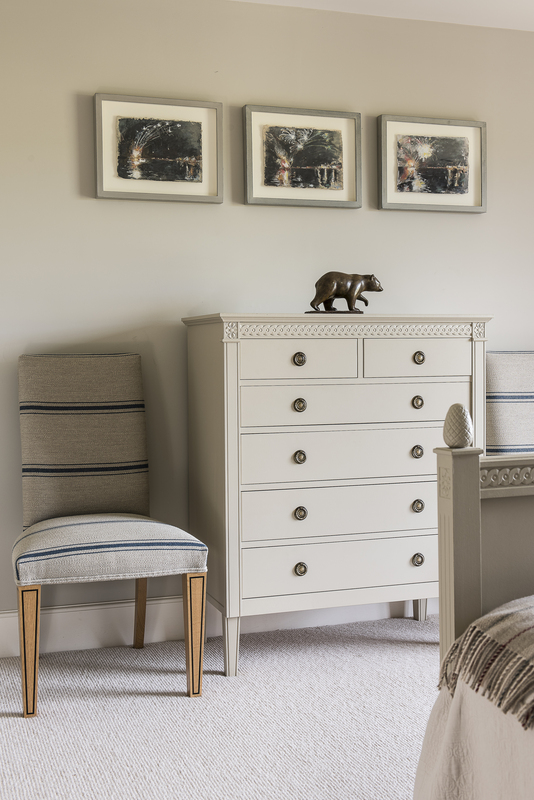 Painted furniture completes the Scandinavian neo-classical styling. All three rooms at this end of the house have retained the original floorboards: “Cox’s stripped and restored them. I’m really glad we did it,” says Belinda. 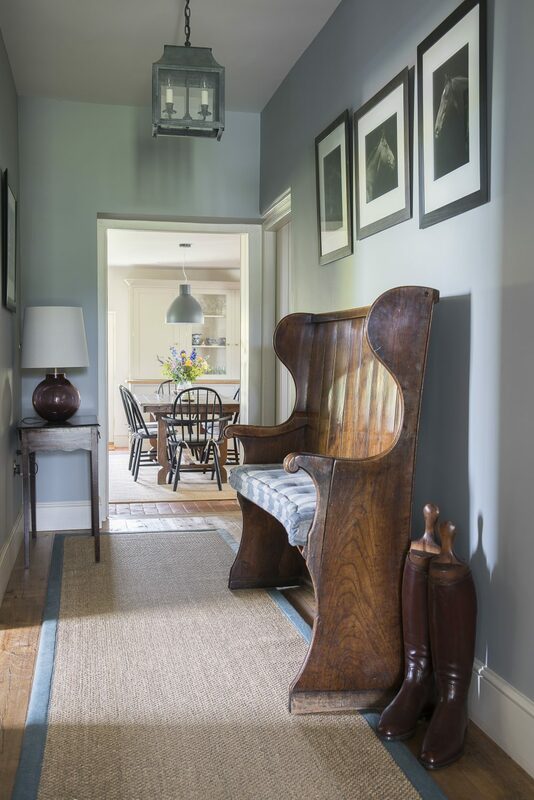 The light colouring and rustic charm of the ancient boards hits just the right note; contemporary and ‘clean’ in their simplicity yet hinting at the building’s past. In this case, her client was happy to oblige and is thrilled by the fact that this classic cast-iron bath is not only supremely comfortable but also looks out over the horse paddocks. The marble basin-surround was chosen specifically by the client and, as we know, few things add a sense of luxury like marble. 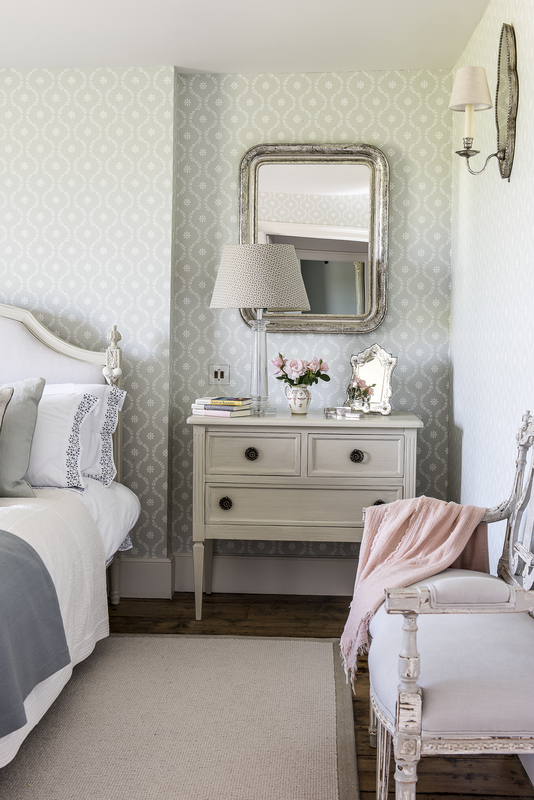 The dressing room is as light as the bedroom and bathroom, with a huge mirror to maximise on the natural light. A beautifully designed fitted cupboard holds shoes and clothing, although more wardrobe space is planned, in the more traditional form of a free-standing wardrobe and drawers. Back in the older part of the house is a cosy guest suite with a view out across the back garden. 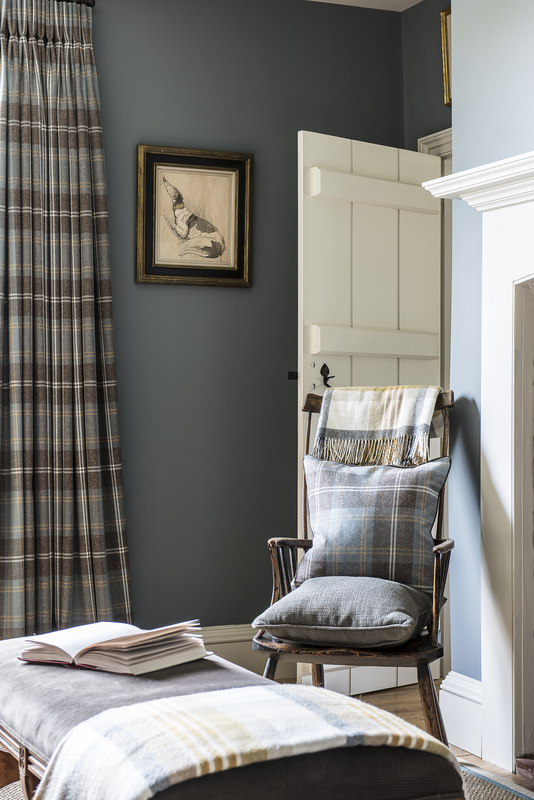 Heavy fabrics and blankets add to the sense of warmth, while colours are muted and furniture painted in a pale grey, again to make the most of the light. The adjoining bathroom feels a little more ‘country’ and less grand, though marble surfaces keep things luxurious. “The contemporary brick effect tiles are from Marlborough Tiles and are ‘offset’ so that they don’t look too institutional,” says Belinda. It certainly works, though it takes a while to notice why they look different. 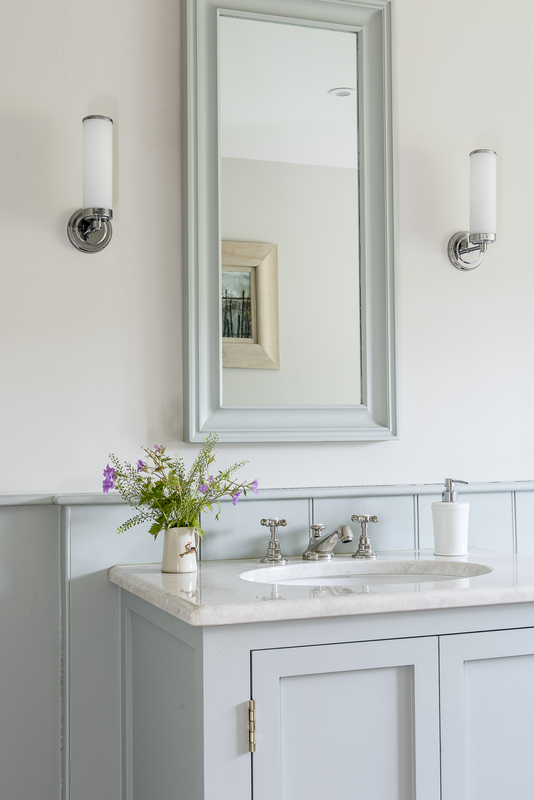 The wooden panelling is tongue and groove, for a rustic feel, and there is a simple narrow mirror above the basin, rather than anything too ornate. The last room to be completed is a study in what was once the hay loft. Its former incarnation is a charming reminder of the building’s history and hopefully one that the owner of the house will enjoy while poring over their paperwork. It sounds as if a very happy new chapter is about to begin. The slipper bath, from Tenterden Bathroom Shop, has views through the sash window over the horse paddocks. Wooden panelling was added on lower walls to give a classical feel. 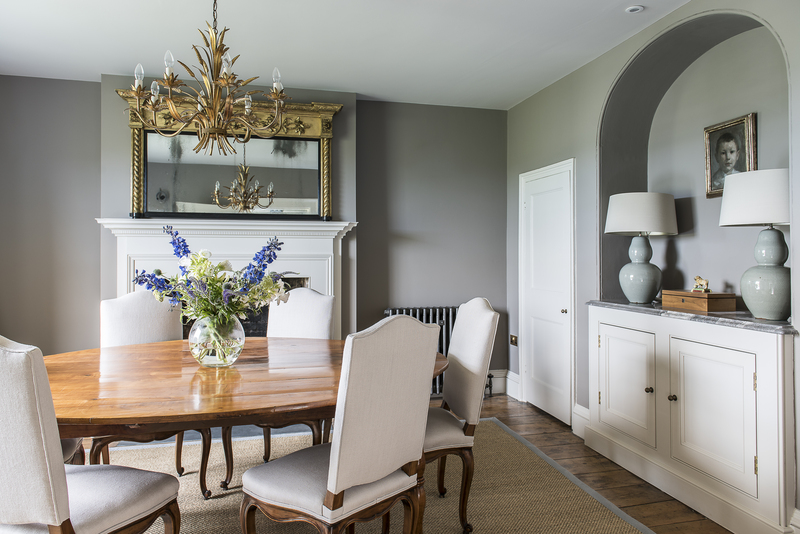 The snug – formerly the kitchen – is painted in Btwn Dog & Wolf by Paint and Paper Library. Looking from the hall into the kitchen. The antique settle (client purchase) cushion is covered in Colefax & Fowler grey and natural check fabric, the glass lamp Porta Romana.